Hurricane 'Sandy' pollution response US Coast Guard unified command completes tank vessel lift on Staten Island, NY. The tank vessel John B. Caddell is a 184-foot tanker ship that washed up on Staten Island as a result of high winds and floodwaters from Hurricane Sandy. The Caddell posed both an environmental and navigational threat to the New York waterways. 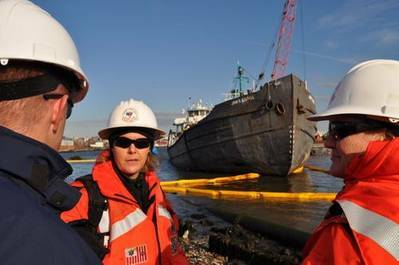 The Hurricane Sandy Pollution Response Unified Command lifted and transported the vessel from Front Street in Staten Island, thus removing that pollution threat to the environment. The Coast Guard worked with New York City Sheriff’s Department, the New York City Office of Emergency Management, New York State Department of Homeland Security and Emergency Services, New York Department of Environmental Conservation, National Oceanic and Atmospheric Administration, the Army Corps of Engineers and Donjon Marine to remove the tanker. Donjon Marine’s heavy-lift crane barge Chesapeake 1000 lifted the Caddell off the shoreline into the water to be checked for seaworthiness and then prepared for transport to the awaiting marine facility. The tanker was transported to a beach slip operated by Donjon Marine. In the picture: U.S. Coast Guard Chief Petty Officer Bridgette Brown discusses the removal with Chief Petty Officer Melinda Bacon.